To give technicians clear vision in the workshop, Philips has introduced the CBH51 LED hybrid professional bonnet lamp, which features 32 powerful LEDs, providing an intense, 6000-k natural white light source and bright wide beam that defeats darkness, but to prevent fatigue, is also gentle on the eyes. The Philips CBH51 offers a useful dual power facility, with ‘boost’ mode giving a powerful 1200 lumens of light output and a wide beam angle of 120°, which is perfect for illuminating the entire work area and helping technicians spot the smallest of details. However, should they use the lamp while unplugged for an extended period, they can select ‘eco’ mode to preserve battery life. At a reduced output of 500 lumens the technician will still have the use of high quality bright light for up to 5.5 hours. For continuous use, the CBH51 is equipped with a robust 5-metre cable and, just like the lamp itself, the cable is built to survive tough workshop conditions and is resistant to chemicals, such as hydrocarbons. 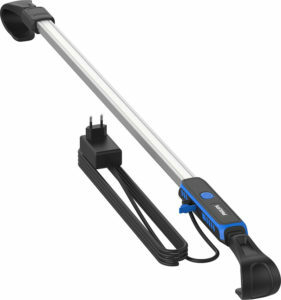 The Philips CBH51 comes with fully integrated telescopic mounting, which can stretch from 1.1 to 1.8 metres and, as the hooks are covered with rubber, there is no need to worry about scratching the vehicle. For greater visibility the lamp can even turn 360° while it remains held in position by the mounting hooks. For more information on the Philips CBH51 visit https://www.philips.co.uk/c-p/LPL45X1/led-professional-work-light-cbh-51-hybrid-aluminium-bonnet-led-lamp.